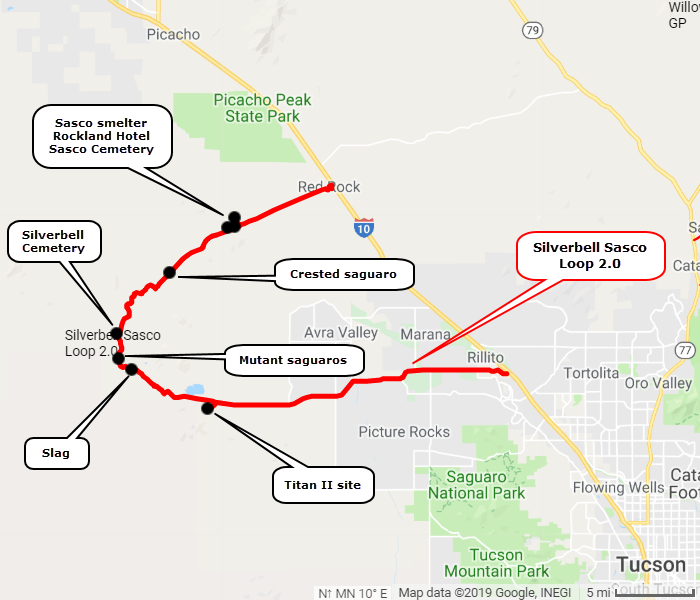 Titan Missile Interpretive Center, Silver Bell Mine, Silverbell Cemetery, mutant saguaros and Sasco ghost town. A fun day on easy roads. Our friend that suggested the trip said it could be done "in a lifted Prius". That is a slight hyperbole, but it is quite easy. Passable by most vehicles with a bit of clearance, but bumpy. The trail can be done in either direction but is described driving clockwise. 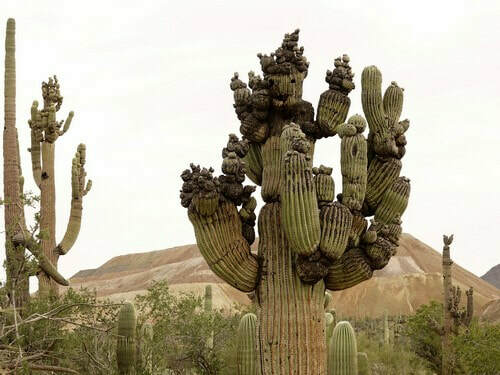 The mutant saguaros are about half way through the trail. Must be a dozen in a very small area. We have no explanation. 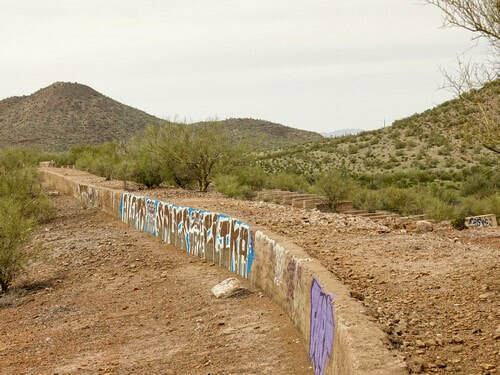 Much of the trail is in the Ironwood Forest National Monument, established in 1990. This Monument is made up of 129,000 acres and contains a significant system of cultural and historical sites covering a 5,000 year period. 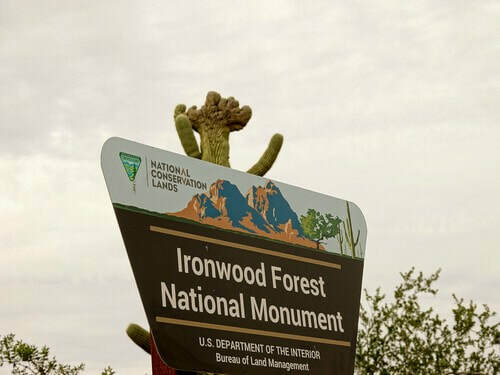 Possessing one of the richest stands of ironwood in the Sonoran Desert, the monument also encompasses several desert mountain ranges including the Silver Bell, Waterman, and Sawtooth, with desert valleys in between. Elevation ranges from 1,800 to 4,261 feet. 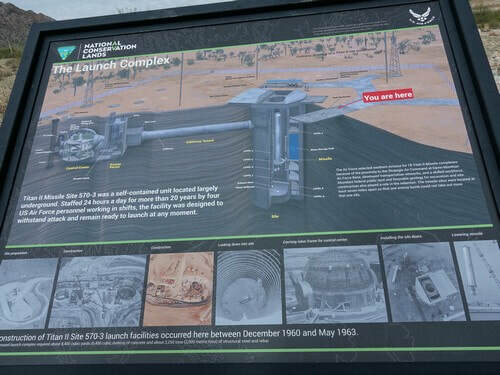 The Titan II Missile Interpretive Site is well worth a visit. 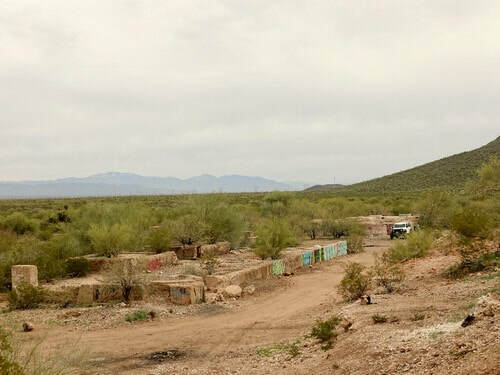 The Titan II Missile sites were located in Arkansas, Kansas and Arizona as a deterrent to nuclear war during the cold war period, and they were manned 24/7 for 24 years, from 1963 to 1987. 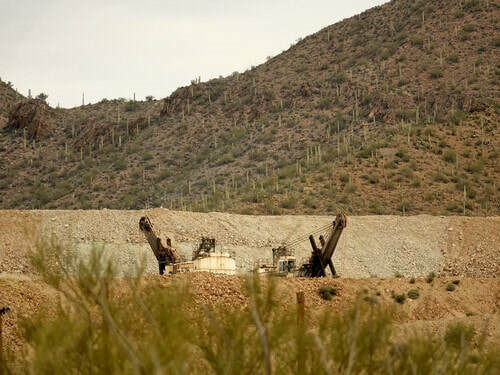 Each site was capable of launching a Titan II Missile in 58 seconds in case of attack on the United States. 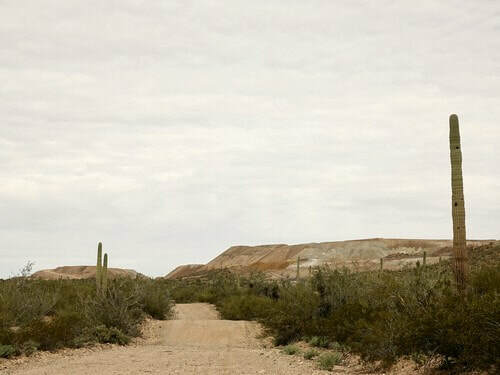 ​The road skirts overburden piles of the Silver Bell Mine, started in 1880 and currently operated by Asarco. Open pits are not visible from the road. 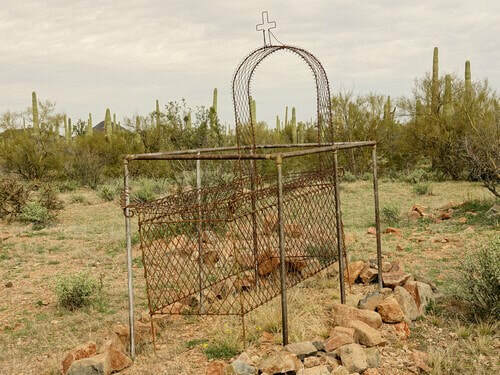 A few relics are visible from the road. 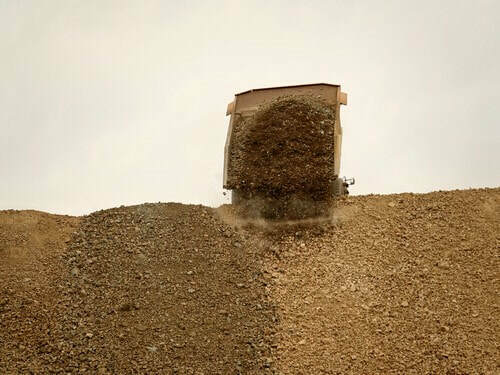 Overburden piles are still growing, as evidenced by this truck. There is an old stone foundation of the upper side of the road and a slag (?) deposit on the lower side. 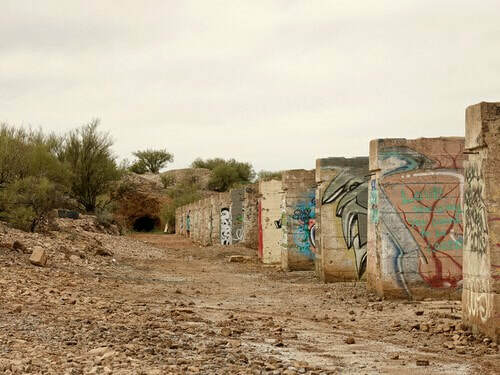 The town of Silverbell was established in 1904 and abandoned in the early 1930's. The cemetery is all that remains today. We found one crested saguaro visible from the road. Nobody seems sure of what causes the crest, but theories include frost, insect infestation or damage from birds, animals, people and weather. 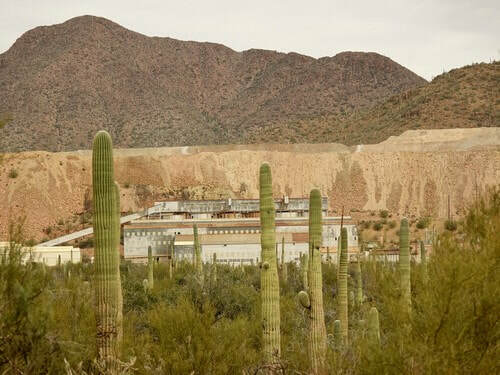 Sasco, which is an acronym for the Southern Arizona Smelter Company, was a company town with a large smelter that served several mines. 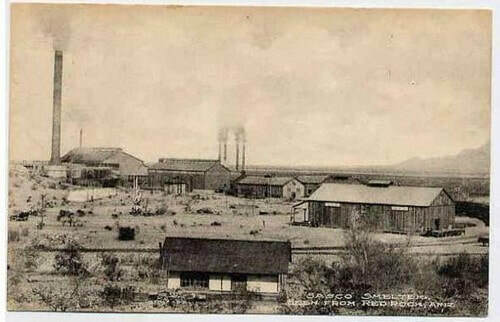 This photo shows the smelter in its heyday. The base of the stack and the foundations of the two structures directly below it are the major remains visible today. Base of the stack and foundations below it. Take time to look higher up the hill. There are other foundations and a wall we cannot explain. 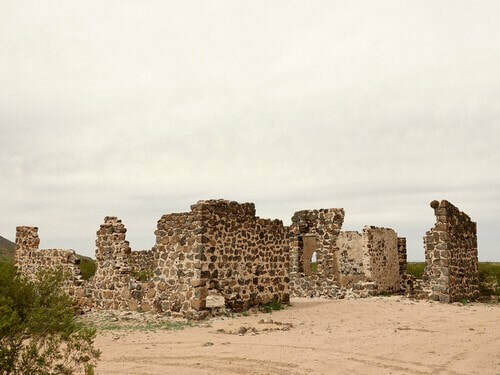 Rockland Hotel is the most prominent ruin remaining from the town of Sasco. 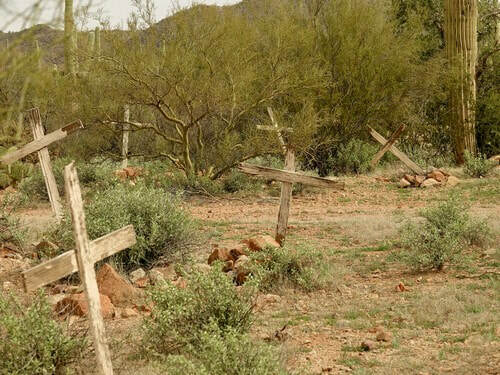 The Sasco Cemetery is privately owned and closed to the public. ​During the winter of 1918 and 1919, the Spanish flu spread to Sasco and devastated it. 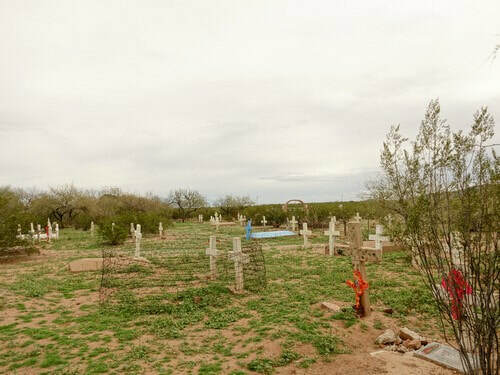 Most of the graves in the Sasco Cemetery with plain concrete headstones represent victims of the pandemic.